*Excellent* heat distribution & retention, improved water flavor & they last for generations! These kettles are unlined & may be used on stoves to heat water. 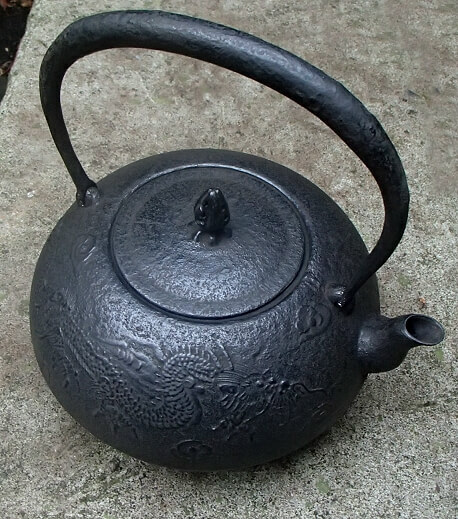 Our Tetsubin iron teapots may be viewed here. 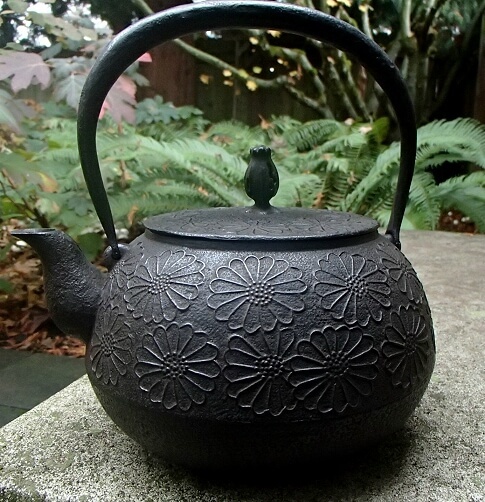 Capture the spirit of Japanese tea preparation with this magnificent Tetsubin from Mizusawa. An alluring dragon surrounded by clouds coils across one side of this kettle's design while the opposing side remains free of decoration. 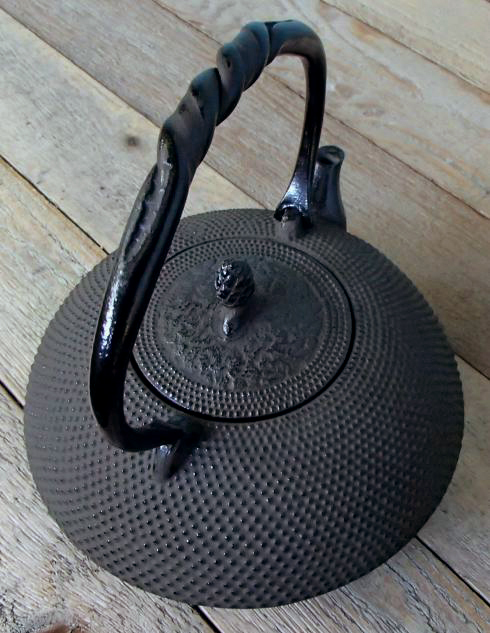 The textured exterior has a dark, brownish charcoal appearance giving it a vintage feel with a textured, non-folding handle and a closed flower bud finial knob atop the lid. This water kettle does not have an enamel interior coating (unlined) and does not have a strainer basket. You may use this Tetsubin kettle to boil water. In fact, I recommend it! Care instructions will be included with every Tetsubin. Most Japanese Tetsubin kettles are traditionally quite large. But not everyone needs, or wants, such a large vessel for making delicious hot water for tea. This Tetsubin is designed with that person in mind! 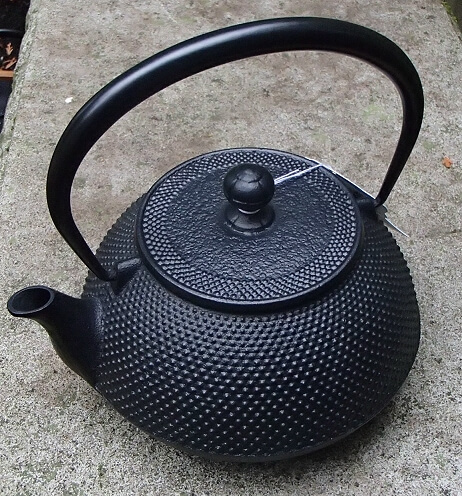 At only 28 ounces, the Miko Kuro Kama will boil the perfect amount of water for a standard sized teapot. 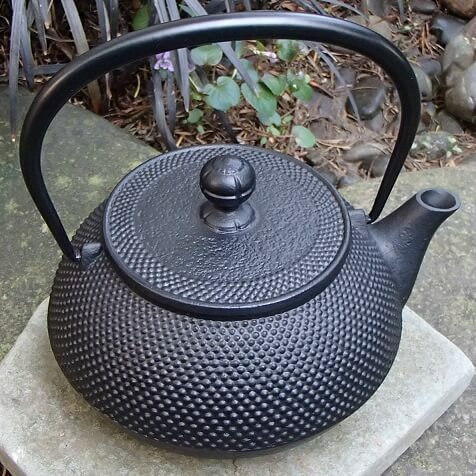 This all black Japanese Tetsubin cast iron kettle is thoroughly modern and, at the same time, highly traditional. Raised hobnails cover the rounded body, an easy to use lid and a solid folding handle complete this Tetsubin design. 6" diameter, 6 3/4" height w/ handle up.